Converting the loft space above your home is an economic way to add space and value to your house. By investing as little as £1,000 you could create a sizeable new room in your property. You could de-clutter your home and use the new room for storage. Alternatively, you could invest a little more into the project and create a proper new living space. Here we will examine the cost of an attic conversion and a wide range of loft conversion ideas to help get your creative juices flowing. Should you do it yourself or hire in a professional? Could you do some of the work yourself and only hire a professional for some parts of the project? You will need to consider the pros and cons of each option before deciding, and we will cover all the important points you will need to think about. Would it be a more sensible choice to create a spare bedroom, or is it worth indulging in that dream home cinema? This is only a decision you can make, but here we will look at some of the most popular designations for attic conversions so that you can make a well-informed choice. There are numerous modern design techniques that you can utilise your available space in the optimum way possible. This means that whatever you want to create with your lift conversion, there should be a way of achieving it, even with limitations such as a sloping roof. Whatever options you choose, it can be an astute way to expand your house, without the hassle of structural extensions to the property. It’s almost guaranteed to improve the quality of life in your present home, as well as add a great deal of value to your property when you come to sell. How Much Will an Attic Conversion Cost? The cost will vary dramatically depending on the size of the loft and what end result is required. Home owners simply wishing to add extra storage to their abode may only need to spend £1,000. This should cover all the basics such as flooring, lighting, a new hatch and a ladder. At the other end of the scale, to transform a large attic into a new living space like a bedroom or office could cost between £25,000 and £40,000. For a small attic, this sort of project would be more in the region of £15,000. Dormers, which are windows built into the slopes of the roof, could contribute up to a third of the total cost, and even ordinary windows can be pricey. However, they are vital if converting to a living space. While undertaking a full conversion can be expensive, you do get a lot for your money. To create a new room in the attic you may require new joists, insulation, plaster boarding, windows, flooring, lighting, electrical fixtures and stairs, not to mention labour. Once complete, you benefit from the extra living space, and it will add a great deal of value to the price of your property, particularly if it is an additional bedroom. In a competitive housing market, an attic conversion makes properties more appealing, and could even clinch a deal due to the added space. Home owners on a budget could seek a home improvement loan to help finance the project. Alternatively, if you have any DIY skills, doing some of the work yourself can save vast amounts of money. As with any home improvement project, there are pros and cons to doing the work yourself. The main advantage of a DIY attic conversion is the reduction in cost. However, there are many points to consider before taking the plunge! For example, if the planned conversion is for a bathroom, this may require plumbing knowledge. A mistake with this type of project could cause endless problems, not only in the loft itself, but also throughout the house. You could always hire in a professional to undertake the work you are not able to do, and the project would still be much cheaper overall. Another major point to think about is the time and effort that a DIY conversion takes. For those working full-time, or even part-time, evenings and weekends will be consumed for a number of months, which is a big commitment. There is no doubt that such an undertaking is hard work, but nevertheless there will be a great deal of satisfaction once the project is complete, and it will have saved thousands of pounds. By hiring a professional, home owners can benefit from peace of mind. Work will be guaranteed and finished to a high standard. It also means that you only have to worry about one bill, instead dealing with the numerous vendors and tradesmen that you might encounter with a DIY project. Hiring a professional provides a “one-stop” solution for attic conversions. Often a specialist builder or firm can be contracted to manage all the responsibilities of the project, from submitting any required planning paperwork to the local council to arranging a skip for waste. Although more expensive than a DIY job, hiring a professional saves you a great deal of time and energy, and ensures a quality result that will add value to the property. Attic Conversion Ideas – What are Your Options? The first things to do when planning an attic conversion are to establish the area of usable floor space, the height of the room and possible access points. Depending on the type of roof, it may not be possible to use the edges of the room, for example. Similarly, the room may be different heights, so the amount of headroom must be considered. An existing hatch may not be in the optimum place, or it may need to be enlarged. If you’re planning on creating a living space with your loft conversion stairs will need to be installed, so there will need to be adequate headroom in the loft, as well as a suitably sized area below. Once these points have been examined, it is time to give thought to the best usage for the room. A basic conversion creates a convenient indoor space for extra storage. There are only a few options to consider such as light fittings and type of loft ladder. However, if adding a living space, there is a great range of options to choose from. This sort of conversion is typically used as a bedroom, bathroom, office or gym, but the possibilities are endless. You could indulge in a home cinema or games room; create a nursery or even a self-contained living area for parents or teenagers. If space is a little tight, you could consider changing the roof structure to enable higher ceilings for more practical accommodation. Depending on the complexity of the project, you can then weigh up what, if any, elements you can undertake yourself, and whether to enlist the services of a professional. Create a spare bedroom from their loft space is one of the most popular loft conversion ideas for home owners. With the potential of adding up to twenty per cent onto the value of the property, it is a savvy option. Whether you need a child’s bedroom or a room to accommodate guests, an attic conversion can enable that extra space without the need to move house. An attic conversion could provide not only a spare room, but also a self-contained living area, if space permits. An en-suite is well worth considering, and many people decide to use such a conversion as their new master suite. Clever design enables the utilisation of every corner, so even parts with low sloping roofs can be used for cupboards and drawers, for instance. The loft is an ideal place for a spare room as it offers separation from the rest of the home and will often benefit from longer-reaching views due to its higher position. Another popular loft conversion idea is the addition of a new bathroom. Using the space for a bathroom means that you can design your new room exactly as you want it, with fixtures, fittings and storage tailored to your needs. You will have to consider certain factors, such as the capabilities of the existing boiler and possible height restrictions, but there are often solutions to issues like these. If the existing system is not powerful enough for the additional hot water output, a shower could be a good alternative, as it heats its own water. If the shape of the roof means there are height limitations, a bath might be a sensible option. Whatever the shape and size of your loft, there are many design techniques that will enable the space to be used to optimum effect. If living space is limited, or when there is a lack of usable garden area, a games room can be a great option for your loft space. Adding a fun new room to your property enables greater enjoyment of the home and can delay the need for moving house. A loft can provide enough space for sought after entertainment features such as a pool table or a model railway. Ideal for families, a games room could be anything from a child’s playroom to a teenager’s den, or it could become the new hub of family life, furnished simply to create a comfortable area for playing together. A games room is a good place to have an arts and crafts area for children, as with an open-plan design, it can be much easier to clean up than other rooms in the house. Whatever way you like to relax, you can design a bespoke games room to fulfil your requirements. There are numerous reasons that mean people often need to be able to work from home. Whether you are self-employed, have flexible working arrangements or need to put in some extra hours during busy periods, it can be difficult to find the seclusion and comfort required to concentrate in the normal family home. Converting your attic is a great way to add a home office to your property. The loft provides the separation from the rest of the house that can be vital for concentration, and depending on the size, can be a light and airy environment in which to work. Even with a sloping roof, the attic can provide a generous area for office furniture. Desks can be installed around the edges so that there is plenty of headroom in the middle, and similarly cupboards and filing cabinets can be accommodated around the perimeter to ensure the main working area is spacious. 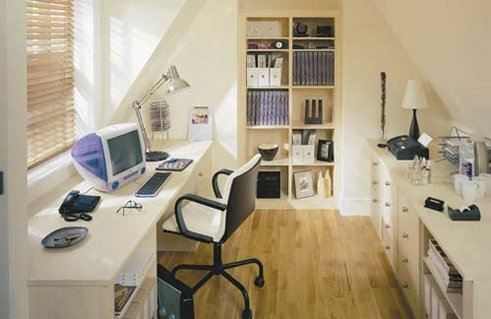 If you work or study at home on a regular basis, an office could be the perfect way to utilise your loft. Gym memberships can be expensive and require travelling as well as the use of communal facilities. As a result, many people are opting to invest in a home gym. It’s a practical way to add an exercise room without compromising existing living space. With a home gym, you can design it to your specific requirements, meaning that, unlike gym memberships, you will only be paying for the equipment you like and use. A loft is often adequate in space to accommodate various pieces of equipment and areas for floor exercises, weights or other training activities. If space permits, you could include an en-suite for your home gym so that you can easily freshen up without having to make your way to the main bathroom. 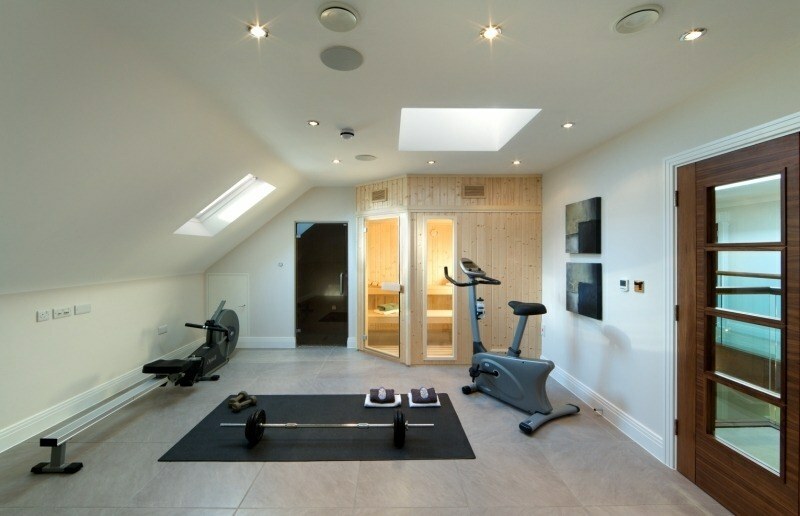 Ventilation is important in an attic home gym, so if there isn’t one already, you may have to add a window. If this is not possible, installing a ceiling fan or air conditioning are good alternatives. Although most homes have at least one television, these are commonly situated in the main living rooms, and are sometimes not ideal for watching the latest movies. 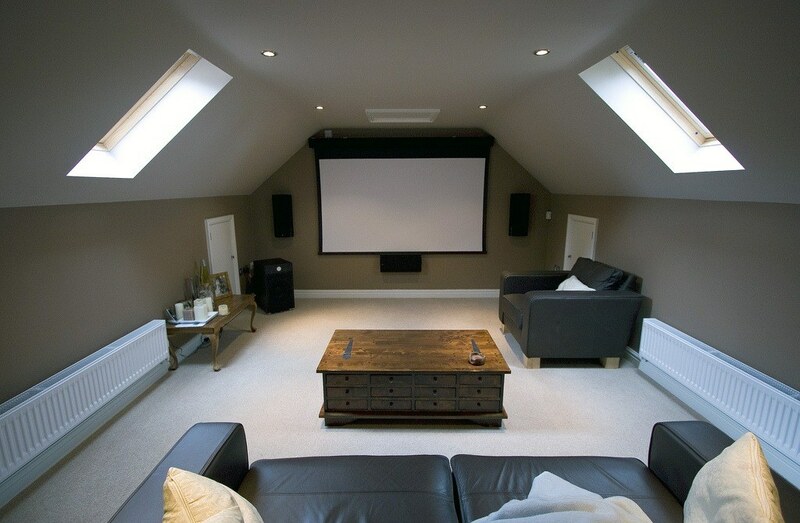 Film enthusiasts may want to consider using a loft renovation to add a home cinema to their property. A luxurious addition to a house, a home cinema provides extra family living space where everyone can become fully immersed in their favourite films. This type of conversion will ensure you get full enjoyment out of your property, and if living space has become tight, may mean you can delay moving house. The attic is the perfect area in which to have a home cinema, as there will likely be no existing windows. Therefore, your new theatre will be able to showcase movies without distortion from intruding slithers of light. Home cinemas are becoming an increasingly popular choice, and will add a wow-factor when selling your house. As you can see, there are plenty of fantastic ideas out there – the only limits are your budget and your imagination!